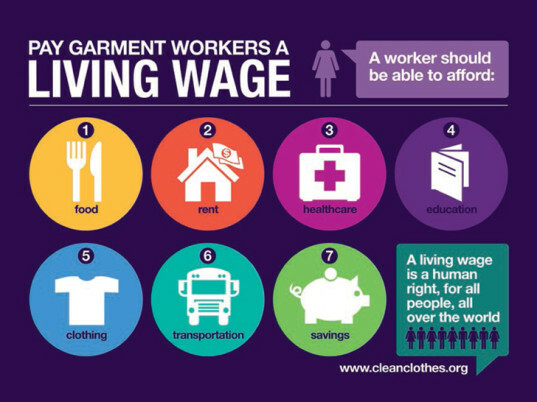 A “living wage” may be a human right, yet when it comes to facilitating lives of dignity for the workers who produce their clothes, most of Europe’s leading apparel brands fall grievously short, according to a new report by the Clean Clothes Campaign. None of the 50 brands surveyed by the international labor alliance in Tailored Wages currently pays a wage sufficient enough to maintain a normal standard of living. And although half of them specified in their codes of conduct a desire to meet their workers’ basic needs, only four of them—Inditex, which operates Zara; Switcher; Marks & Spencer; and Tchibo—are taking steps to translate those policies into action. 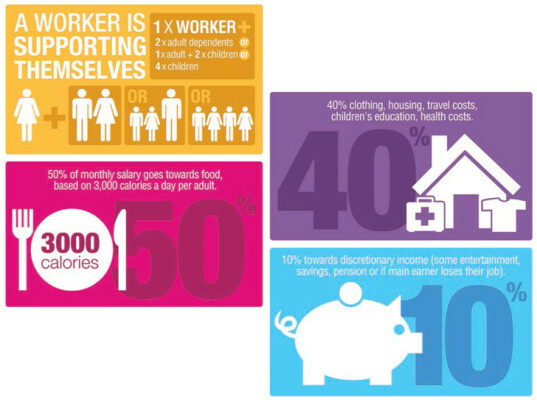 Millions of garment workers and their families live lives of abject poverty. For most of the world’s garment workers, however, the reality is a life of abject poverty—a “very thin and fragile” lifeline that offers little of the economic advancement that globalization has promised. The survey highlights some innovative schemes certain brands have implemented to increase the wages of their workers. Switzerland-based Switcher, for instance, has established a fund that pays workers an additional 1 percent on top of the price paid to the factory. Others, such as Inditex, are inking agreements with global labor unions like IndustriAll to ensure better working conditions. Still, these efforts need accelerating, McMullen says. 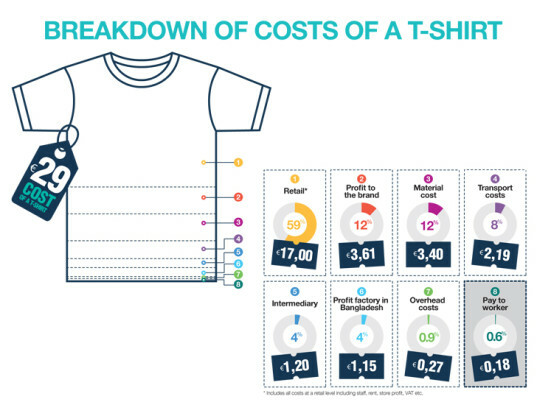 Recent figures from the Asia Floor Wage Alliance show that costs of living in garment-producing countries such as Bangladesh and Cambodia are, on average, three times the minimum wage a garment worker receives. Cambodian workers currently receive $100 per month—just 25 percent of the Asian Floor Wage calculation for Cambodia. According to the Clean Clothes Campaign, very few retailers have tried to “truly ingrain throughout their business work towards a living wage.” Per Tailored Wages, most retailers fall in one of four silos. The Clean Clothes Campaign’s inclusion of H&M the “unconvincing” category might be surprising to some. After all, the Swedish retailer publicly outlined a road map for fair wages in November. Despite many “good elements” to the program that H&M has developed, including its willingness to pay its suppliers more, the company has not committed to any clear living-wage benchmark or any way to measure success. H&M has not committed to any clear living-wage benchmark or any way to measure success. H&M, the campaign adds, needs to commit to raise the wage via a benchmark. “Such a commitment may open the space in negotiations for trade unions to make wage demands that represent the real needs of workers,” she adds. H&M also needs to go further by ensuring the inclusion of local unions. “Signing the Indonesia Protocol would be a good step and a learning experience,” McMullen says, adding that the agreement, already signed by a number of major sportswear-makers, is delivering concrete actions to enable better workplace representation across many suppliers. H&M for its part, says that it uses its textile workers’ “own perception” what a fair living wage is as its definition of a living wage. “Our role and responsibility is to help create a working environment in the factories where a skilled workforce have their wages reviewed annually and negotiated either on factory and/or sectorial and government level, involving freely elected trade union or worker representatives,” it says in a press release.